As part of Brian McGrath's Theory of Urban Form studio, I set out to understand the new urban forms rapidly being constructed in Phnom Penh relative to its historical urban patrimony. Rather than illustrate a chronological history of growth, the project seeks to present the form of the city as produced by historical ruptures. My research began with the collection of available historical maps and views. Additionally, by tracing 2014 Google Earth satellite imagery, I updated the most recent municipal-based map of Phnom Penh from 1997. Following are six figure-ground maps from selected time frames that represent the historical ruptures identified in my archival research. Each map can be seen as representing a different city of different urban form built by different city actors with different political, economic, and cultural goals. Through this analysis, the urban form of the most recent time period 1972-2014 can be evaluated in relation to the legacy of Phnom Penh’s past. Found in 1372 AD, Phnom Penh did not become the permanent capital of Cambodia until in 1865. The majority of the population in Phnom Penh lived along the west bank of the Tonlé Sap and Bassac Rivers in bamboo and wood structures with hatched roofs. Established in 1863, the French protectorate constructed the new capital for Cambodia in attempt to modernize the city’s appearance. Historically, the colonial urban form of Phnom Penh was forged through two primary planning efforts that unfolded during the 1890s and the 1920s. The population of Phnom Penh grew from 350,000 in 1865 to around 2.3 million today (approximately 15% of Cambodia’s 14.8 million inhabitants in 2013). Phnom Penh has grown to be the national center of politics, economics, culture, diplomacy, and trade. phnom penh figure-ground 1867. pen sereypagna & brian mcgrath, 2014.
phnom penh figure-ground 1868-1886. pen sereypagna and brian mcgrath, 2014. In the 1890s, the French started to build a street grid in the swampy area to the south that followed ethnic group lines. There was a French Quarter for administration, a Chinese Quarter for business, and a Khmer Quarter for local residents along the Mekong River. Phnom Penh's administrative center was established as a place to rule over the entire city and, therefore, re-center it. The King's property was the property of the State. A real estate market was established to allow the purchase and transfer of urban property. As a result, Phnom Penh experienced a construction boom. 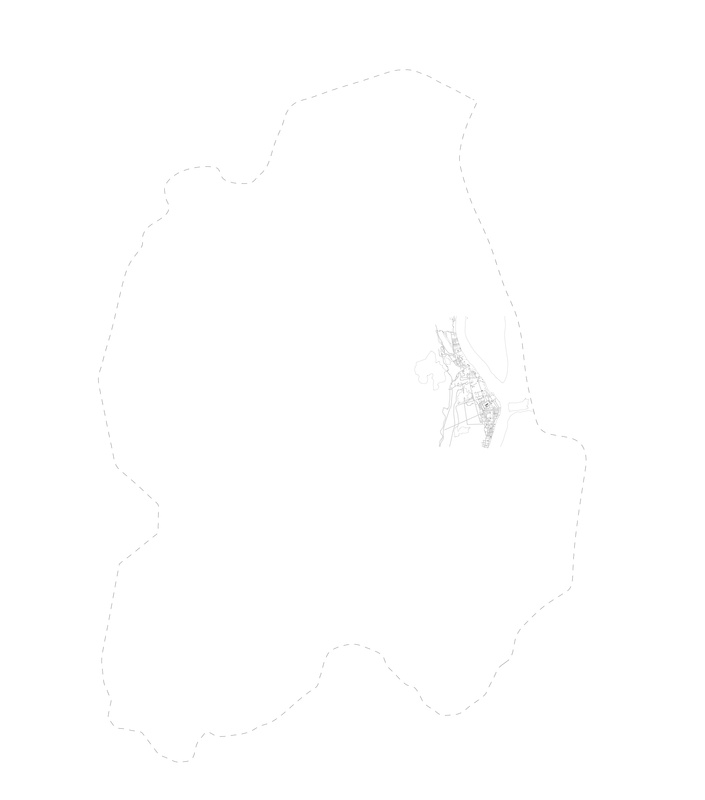 phnom penh figure-ground 1887-192. pen sereypagna & brian mcgrath, 2014. In the early twentieth century, the main institutions of Cambodian culture were built in the Khmer quarter—including the Pali School, the School of Fine Arts, the National Museum of Cambodia, and the Royal Library. There was a long boulevard to the west of the city that was used for traveling to the coast of Cambodia. It seems that the French had started to find a new way for doing trade besides using the Mekong River. Other new infrastructures began to appear along this road—such as the horse racing field and the beginnings of a city dike. A long road to Takhmao was built to connect the city to the South. Apart from these changes in the Khmer Quarter, the majority of urban transformation occurred in the French and Chinese Quarters. 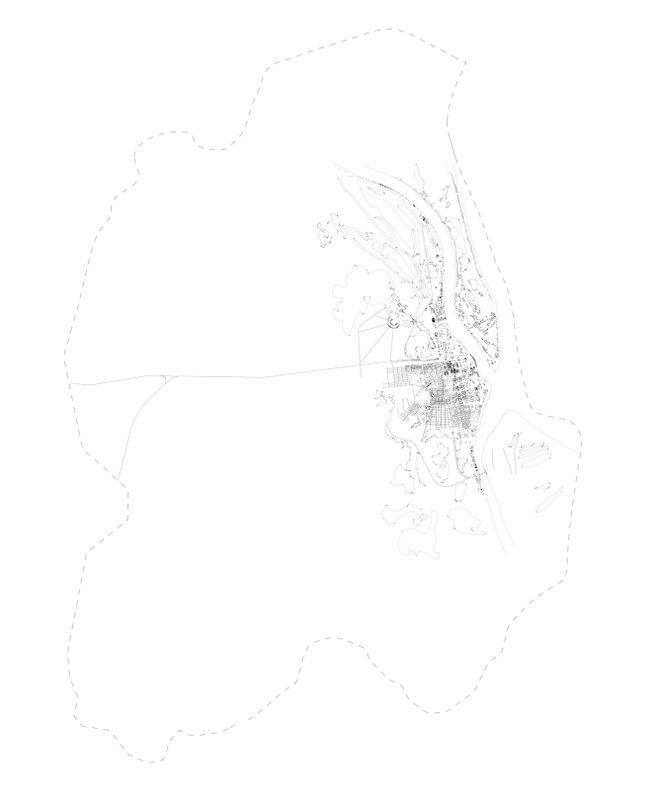 phnom penh figure-ground 1922-1950. pen sereypagna & brian mcgrath, 2014. Cambodia gained independence in 1953, ushering in the 'Golden Age'— also known as the second splendid period after the Angkor period. Under the leadership of Prince Norodom Sihanouk, Phnom Penh focused on national infrastructure projects such as the National Sport Complex and Village Apartments as well as the Roy- al University Campus. From 1958 to 1968, Phnom Penh doubled in size. The cosmopolitanism and the visual order of Phnom Penh in the 1960s allowed the city to gain a reputation as the ‘Garden City in Southeast Asia.’ Urban planning followed boulevards and monuments—traces left by the colonial regime—as anchoring devices to establish a system of urban order. Expansion of the city to the west was facilitated by the construction of dikes which extended from colonial planning and formed a series of concentric arcs for the city’s major boulevards. During the rainy season, water must be either pumped out toward the river, or directed inwards, toward the natural reservoirs called boeung (lakes). New residents built wooden houses on stilts around these lakes because they were inside the dike and this protected them from flooding. In addition the lake provided a resource for food, supported a micro-economy, and there was a lack of available housing elsewhere in the city. 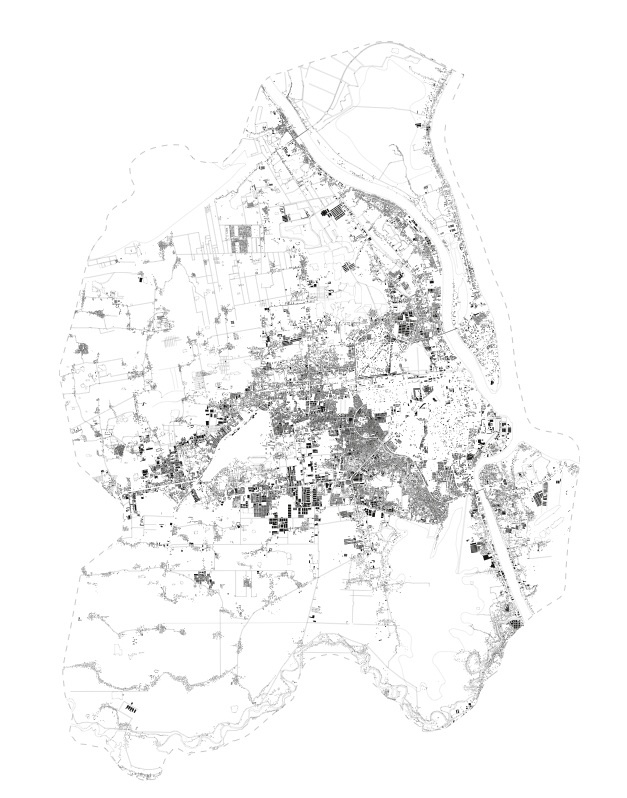 phnom penh figure-ground 1951-1971. pen sereypagna & brian mcgrath, 2014. After the civil war, throughout them 1980s, many people came to Phnom Penh to find a place to live. Yet the city lacked the capacity to provide housing. People were forced to take shelter in any empty house they could find. Phnom Penh still lacks a plan to provide adequate public housing. Large portions of the population have fashioned their own homes and neighborhoods, albeit without services or rights. Periodically, people are forcibly moved to the suburbs. New mega-developments, designed as satellite cities were being built on the water systems such as lakes or ponds. Together these water bodies form a chain that follows the Mekong River from north to south and function as an important infrastructure for water management. On a smaller scale, water channels have been replaced by many small paths in the center of the city. Diamond Island is an important mega-development project. The gate to the island is a bridge across a narrow channel of water. It is held in place by new riverfront promenades that transform the sediments of the Bassac Delta hydro system into a scenic environment for a variety of activities, from wedding celebrations to casino gambling. 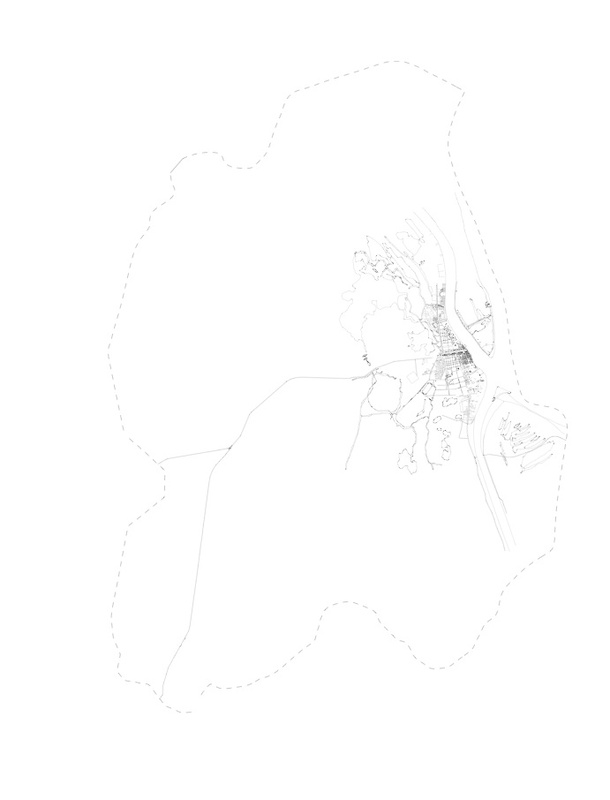 phnom penh figure-ground 1972-2014. pen sereypagna & brian mcgrath, 2014. In the past, Phnom Penh was ruled by a King. Life was governed according to the laws of religion and nature. The River was revered as a natural phenomena that provided food for people. Most people’s lives depended on fishing, which meant many settled along the river. The Khmer believed that religion created everything on Earth. They lived around the Royal Palace and Wat Phnom to accompany the King and religion, Buddhism. In short, The Royal Palace, Wat Phnom, and the River were the fundamental elements that created the genealogy of Phnom Penh. The French introduced a new political form to Phnom Penh. During the colonial period, they separated the city into three quarters of governance: French, Chinese, and Khmer. Each quarter had a unique urban form, function, size, and building typology in the colonial system. Boulevards and geometric grid systems were implemented to build the city. Dikes protected the city from flooding and formed boulevards. Considering the diversity of building form and size, this organization served as a good way to guarantee urban homogeneity. The port and railroad were constructed for trading inside and outside the country. Following the end of French colonial period, Phnom Penh entered post-independent urbanism, associating nation-building with city-building. The urban form of the city was an extension of the urban grid of France. Modernization of Phnom Penh was catalyzed by the development of various infrastructures including the Independence Monument, the National Sports Complex, and the Bassac Riverfront development. During the post-war period, Phnom Penh began to grow again. In 2000, the economy was propelled by an extraordinary boom in construction, which privatized many public buildings and land. 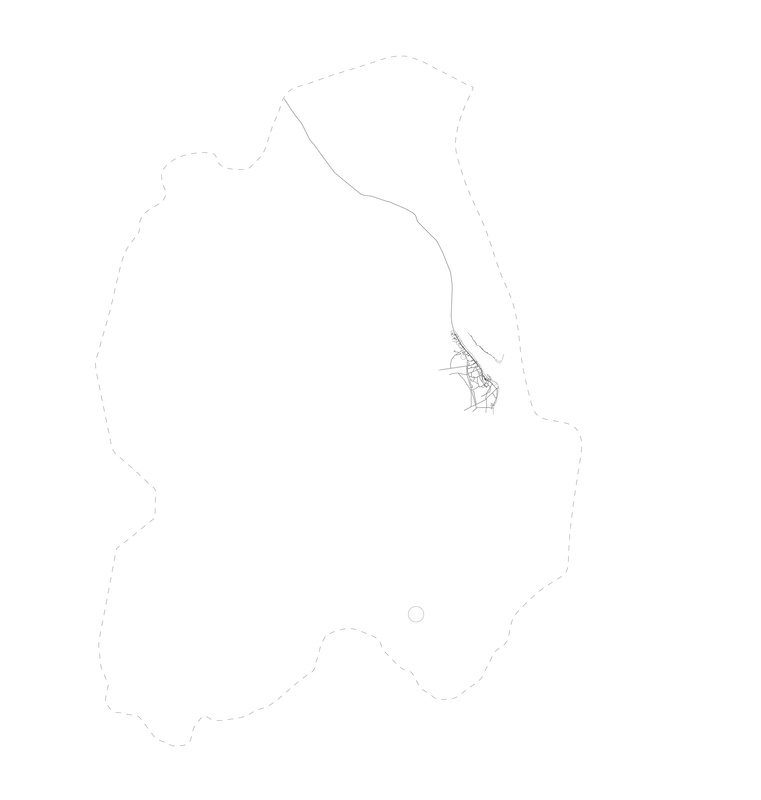 This speculative city filled lakes and added islands in the river for housing. The primary focus was globalization and the develop- ment of private enclaves, rather than the public realm. 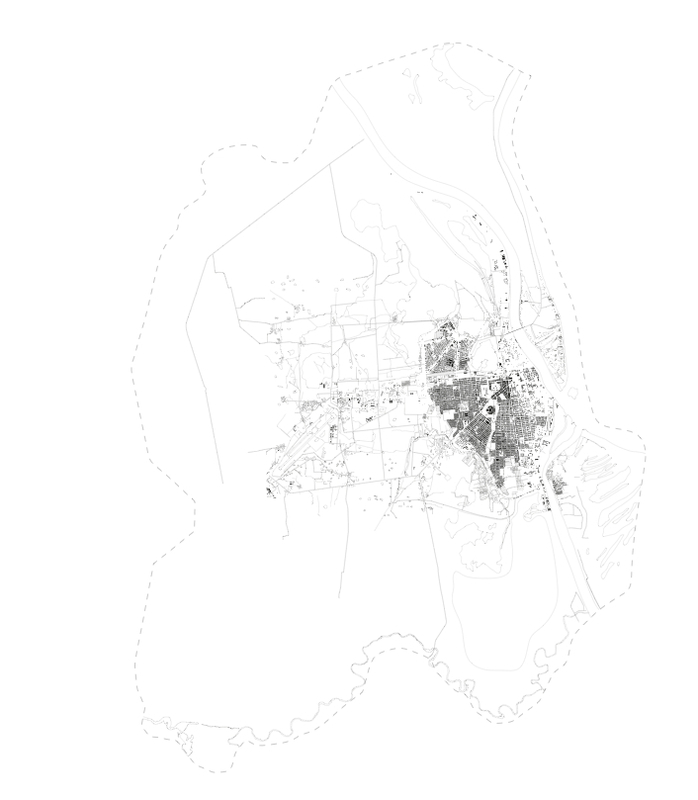 By investigating the movement of genealogy through time and space, these six figure-ground maps illustrate the differences in quality and quantity of urbanism in Phnom Penh. The present city is a combination of all past urbanisms. The Phnom Penh of the future needs to understand these differences in order to move forward.